On this day in history, December 3, 1780, General Nathanael Greene takes over the Southern Department of the Continental Army after the Americans suffered a string of defeats in the southern states. General Robert Howe lost the city of Savannah, Georgia; General Benjamin Lincoln lost the city of Charleston, South Carolina with over 5,000 soldiers; and in August, 1780, General Horatio Gates' army was destroyed at Camden, South Carolina with almost 2,000 men killed or captured. These losses left South Carolina and Georgia completely in British hands. British General Charles Cornwallis then turned his sights on North Carolina and his ultimate goal, Virginia. After these defeats, morale was at an all-time low in the southern colonies. There was virtually no army remaining. Congress needed to turn something around before the South was completely lost. Congress had bypassed George Washington's authority by appointing all three failed generals in the South. This time, they deferred to Washington's judgment as Commander-in-Chief, who immediately selected General Nathanael Greene to take over. Greene had already proved himself in battles at Trenton, Brandywine, Germantown, Monmouth and Newport and had shown an enormous talent for organizing and logistics as Quartermaster General at Valley Forge. 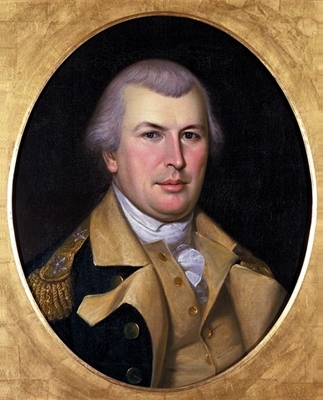 Nathanael Greene was the owner of a foundry in Coventry, Rhode Island and had trained himself in the art of war through books. 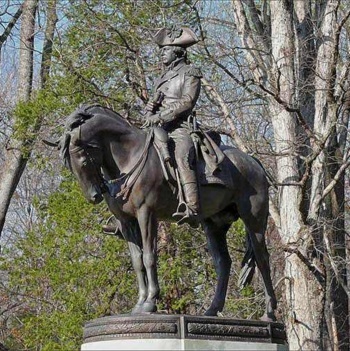 He was appointed a Major General in Rhode Island at the outbreak of the war and soon became a Brigadier General in the Continental Army, becoming one of Washington's most trusted advisers. Greene took charge of the Southern Department at Charlotte, North Carolina on December 3, 1780 and things immediately began to turn around. Greene first concentrated on rebuilding the forces with the help of his legendary organizational skills and ability to procure supplies and garner local support. He began making strikes against Cornwallis, but would pull back and outrun the British pursuers, often using swollen rivers to keep distance between them. Cornwallis' army began to wear out as Greene drew them further inland, away from their supply depots on the coast. Greene gathered all the forces he could to Guilford Courthouse in Greensboro, North Carolina and fought a battle there that was extremely costly to the British, who were forced to return to their base at Wilmington on the sea. Cornwallis decided to abandon his attempt to conquer North Carolina and he turned north to Virginia instead, setting up the surrender at Yorktown less than one year later.